THERE are precious few secrets that can be guarded for half a millennia, but the Royal Collection is among them. One of the greatest collections of art the world has ever seen, it is a dizzyingly comprehensive chronicle of man’s cultural expression since the 16th century. From the drawings of da Vinci to the works of Rembrandt, Vermeer, Monet and Michelangelo to name but four masters, it includes some of the rarest and most valuable objets d’art from the Italian Renaissance and beyond, amassed over the centuries by members of the Royal Family. Spanning 7,500 oils, 500,000 prints, 30,000 watercolours and drawings, and a barrage of sculpture, jewellery, ceramics, gold, silver, furniture, armour, manuscripts and textiles, its scale dwarfs the Tate’s treasure trove of 70,000 artworks and makes the 2,300 cared for the National Gallery look like a reception room in a community council building. It is a collection which bewilders those who seek to value what is essentially priceless. The handful who have tried suggest a figure of between £10 billion and £13bn. The truth is we will never know, thanks to the most remarkable fact about the Royal Collection: it is inalienable, held in trust for us, the nation. This summer, Scots will have the opportunity to acquaint themselves with some of the collection’s artefacts thanks to the latest of several exhibitions to have been staged at the Queen’s Gallery in Edinburgh’s Palace of Holyroodhouse. 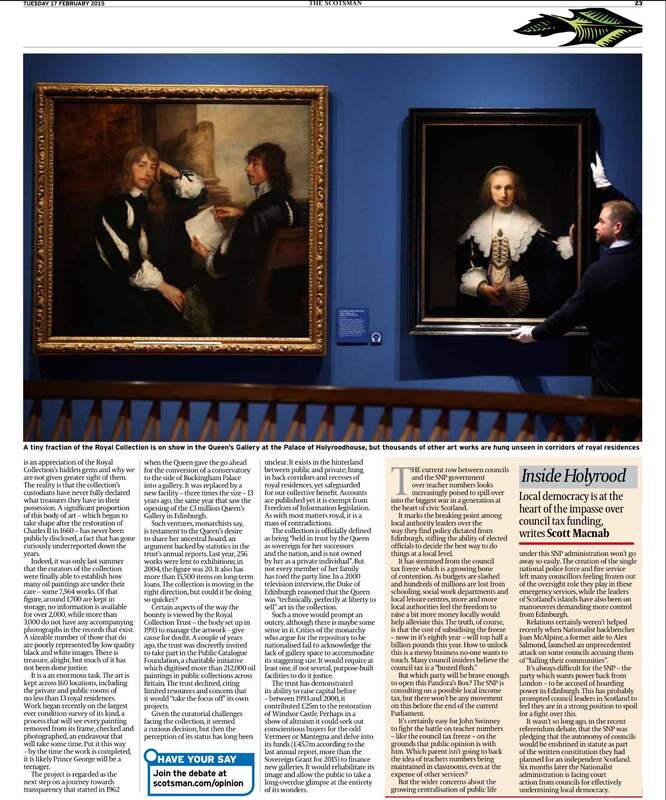 A showpiece of Scottish art featuring works by the likes of Allan Ramsay and Sir David Wilkie, some of which have not been shown in public before, the exhibition promises to be an absorbing affair, even it might lack the high-profile names for a broader appeal. What it might achieve, however, is an appreciation of the Royal Collection’s hidden gems and why we are not given greater sight of them. The reality is that the collection’s custodians have never fully declared what treasures they have in their possession. A significant proportion of this body of art – which began to take shape after the restoration of Charles II in 1660 – has never been publicly disclosed, a fact that has gone curiously underreported down the years. Indeed, it was only last summer that the curators of the collection were finally able to establish how many oil paintings are under their care – some 7,564 works. Of that figure, around 1,700 are kept in storage, no information is available for over 2,000, while more than 3,000 do not have any accompanying photographs in the records that exist. A sizeable number of those that do are poorly represented by low quality black and white images. There is treasure, alright, but much of it has not been done justice. It is a an enormous task. The art is kept across 160 locations, including the private and public rooms of no less than 13 royal residences. Work began recently on the largest ever condition survey of its kind, a process that will see every painting removed from its frame, checked and photographed, an endeavour that will take some time. Put it this way – by the time the work is completed, it is likely Prince George will be a teenager. The project is regarded as the next step on a journey towards transparency that started in 1962 when the Queen gave the go ahead for the conversion of a conservatory to the side of Buckingham Palace into a gallery. It was replaced by a new facility – three times the size – 13 years ago, the same year that saw the opening of the £3 million Queen’s Gallery in Edinburgh. Such ventures, monarchists say, is testament to the Queen’s desire to share her ancestral hoard, an argument backed by statistics in the trust’s annual reports. Last year, 256 works were lent to exhibitions; in 2004, the figure was 20. It also has more than 15,500 items on long-term loans. The collection is moving in the right direction, but could it be doing so quicker? Certain aspects of the way the bounty is viewed by the Royal Collection Trust – the body set up in 1993 to manage the artwork – give cause for doubt. A couple of years ago, the trust was discreetly invited to take part in the Public Catalogue Foundation, a charitable initiative which digitised more than 212,000 oil paintings in public collections across Britain. The trust declined, citing limited resources and concern that it would “take the focus off” its own projects. Given the curatorial challenges facing the collection, it seemed a curious decision, but then the perception of its status has long been unclear. It exists in the hinterland between public and private; hung in back corridors and recesses of royal residences, yet safeguarded for our collective benefit. Accounts are published yet it is exempt from Freedom of Information legislation. As with most matters royal, it is a mass of contradictions. The collection is officially defined as being “held in trust by the Queen as sovereign for her successors and the nation, and is not owned by her as a private individual”. But not every member of her family has toed the party line. In a 2000 television interview, the Duke of Edinburgh reasoned that the Queen was “technically, perfectly at liberty to sell” art in the collection. Such a move would prompt an outcry, although there is maybe some sense in it. 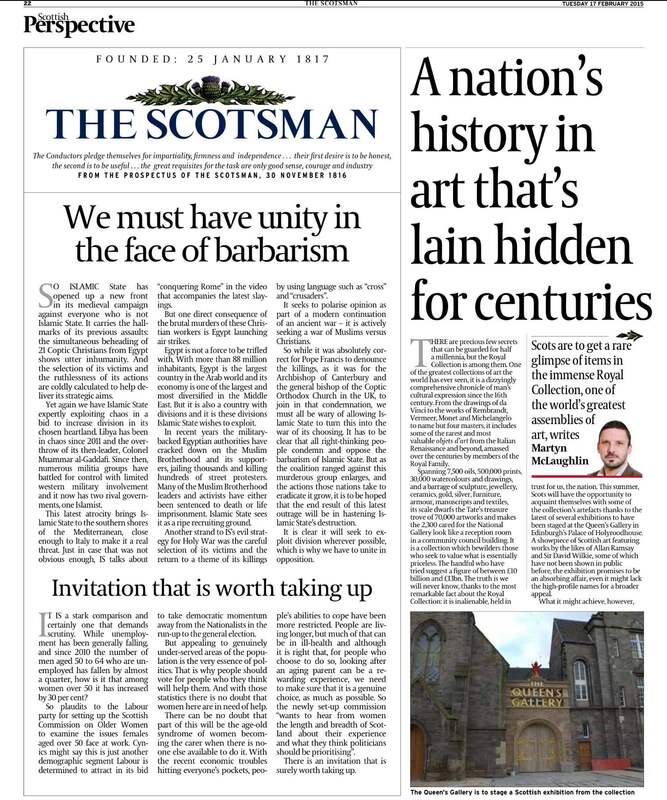 Critics of the monarchy who argue for the repository to be nationalised fail to acknowledge the lack of gallery space to accommodate its staggering size. It would require at least one, if not several, purpose-built facilities to do it justice. The trust has demonstrated its ability to raise capital before – between 1993 and 2000, it contributed £25m to the restoration of Windsor Castle. Perhaps in a show of altruism it could seek out conscientious buyers for the odd Vermeer or Mantegna and delve into its funds (£45.7m according to the last annual report, more than the Sovereign Grant for 2015) to finance new galleries. It would rehabilitate its image and allow the public to take a long-overdue glimpse at the entirety of its wonders.